for the Copernicus Atmosphere Monitoring Service (CAMS) and Copernicus Climate Change Service (C3S). Copernicus is the European Programme for the establishment of a European capacity for Earth Observation and environmental information. The Copernicus Climate Change Service (C3S) is one of the six services within Copernicus. The Copernicus Atmosphere monitoring Services (CAMS) is one of the six services within Copernicus. The Copernicus programme is coordinated and managed by the European Commission. The European Centre for Medium-range Weather Forecasts (ECMWF) implements the Copernicus Climate Change Service and the Copernicus Atmosphere Monitoring Service on behalf of the European Commission. “We need to talk more about ‘Ocean Change’ and the effects of acidification, warming and so on,” said the United Nations Special Envoy for the Ocean, Peter Thomson, at the UN Ocean Conference in 2017. “As it stands, SDG14 [United Nation Sustainable Development Goal 14, protecting life below the water] represents the only universal commitment we have to save life in the ocean for our grandchildren to enjoy.” This international initiative and other environmental directives, particularly on the European level, hinge on the availability of ocean data to monitor threats like acidification and the health of the marine food chain, which directly affect human health. The Copernicus Marine Service is regularly updating its product portfolio with new or improved products. This issue of Copernicus Observer presents the latest evolutions. Marine life is vital for the economic and food security of billions of people. Hence marine ecosystem health must therefore be viewed through the lens of human health. In order to keep track of the marine ecosystem’s health even more efficiently, the Copernicus programme’s marine component, the Copernicus Marine Service, has expanded its offer as it strives to continually respond to the needs of the global community. In April 2019, a new product of the family of biogeochemical variables was released: the ocean pH, indicator of the ocean acidity, crucial for understanding the pressures put on marine ecosystems. A full suite of biogeochemical observation-based products and models are now available and are presented below. The updates expand on and strengthen the existing extensive biogeochemical catalogue of products that are produced thanks to modelling and include a wide range of variables, from nutrients and plankton to oxygen and carbon dioxide distribution (CO2). These products have benefited from research and development (R&D) performed as part of the Atlantos Horizon 2020 project and various Copernicus Marine Service Evolution R&D projects. Given our rapidly changing environment, models play a key role in predicting future scenarios describing the possible impact of climate change on the oceans and marine ecosystems, and providing information in areas where direct observations are not available. Mercator Ocean International is, by the way, developing a new version of the Copernicus Marine global biogeochemical model, which will lead to better indicators for ocean monitoring and forecasting. Ocean acidity and other variables related to the ocean’s uptake of excess carbon from the atmosphere from 2001 to 2017 (see here). These are derived from in situ data sets (SOCAT) and data fusion techniques. Nutrients – includes the addition of in situ data on the concentration of nitrates, phosphates and silicates (see here). These are computed using data fusion techniques applied to Argo biogeochemical (Argo BGC) floats equipped with an oxygen sensor. Argo BGC is an extension of the Argo programme, which includes a global array of some 4,000 in situ floats that take key ocean measurements (called profiles). The ocean acts as a sinkhole for the excess CO2 in the atmosphere produced by human activities. As such, it buffers the warming effects that this CO2 would have if left in the atmosphere. However, the price for this buffering is a dramatic change in the ocean’s chemistry, commonly referred to as ocean acidification. It is unclear whether the ocean can continue to absorb CO2 at the same rate or if it may become saturated. Moreover, an increasingly acidic ocean puts marine ecosystems at risk as this can impact biological processes like photosynthesis, respiration, calcification and reproduction among other things. Calcifying species like shellfish, coral and even phytoplankton are particularly affected as their shells and skeletons may not be able to withstand the changing ocean chemistry. All this leads to less biodiversity and thus, less food security for humans. In mid-April of this year, the Copernicus Marine Service released much anticipated carbonate products that help measure the ocean’s uptake/absorption of atmospheric CO2. These include: 1) ocean acidity (seawater pH) surface distribution across the ocean; 2) ocean surface partial pressure of CO2, and 3) sea-to-air flux of CO2 (the ocean’s uptake of CO2). These products are derived from a combination of in situ technology (including ships), numerical models and a neural network that uses machine learning and indirect measurements to estimate variables in areas where no data is available. 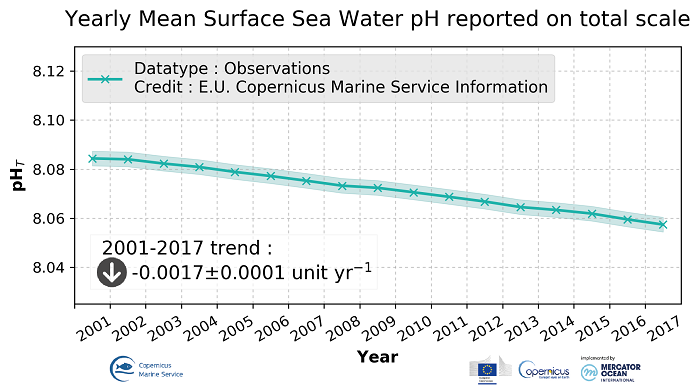 Prior to the release of the acidity variable in the catalogue, the Copernicus Marine Service released the global ocean acidity yearly mean trend from 2001-2017 under their Ocean Monitoring Indicator section (OMI) (refer to the graph below) that was selected to support the publication of the 2018 European SDG14 indicator related to ocean acidity (Eurostat publication). The trend in the results shows that the ocean is steadily becoming more acidic over time with the pH decreasing by 0.0017 pH units annually. The pH of contemporary surface ocean waters is already 0.1 pH units lower than in pre-industrial times. This 0.1 pH unit change is equivalent to a 30% increase in ocean acidity since pre-industrial times. The new pH product adds detail to this OMI trend, by showing that the distribution of acidification is not homogeneous across the ocean. The pH is displayed on a regular grid (1°x1°) with a monthly resolution from 2001 to the end of 2017. The most acidic regions (with low pH values) are found in upwelling regions such as the Equatorial Pacific Ocean and the Arabian Sea where old naturally dissolved inorganic carbon-enriched waters reach the ocean surface. The less acidic regions (with higher pH values) are found in subpolar and polar waters, especially during spring and summer when photosynthesis draws down dissolved inorganic carbon. Additionally, this new product includes two other key parameters: ocean surface partial pressure of CO2 and surface ocean CO2 flux (which measures the ocean’s uptake of CO2). The partial pressure of CO2 is the gas phase of CO2 above the ocean surface, which finds equilibrium with the CO2 in the water, thereby determining the extent to which the CO2 dissolves in the water. This is an important variable for monitoring CO2 in the Earth system as well as calculating and estimating the other CO2-related variables. These products are derived from a neural network methodology using the SOCAT data set (in situ network). 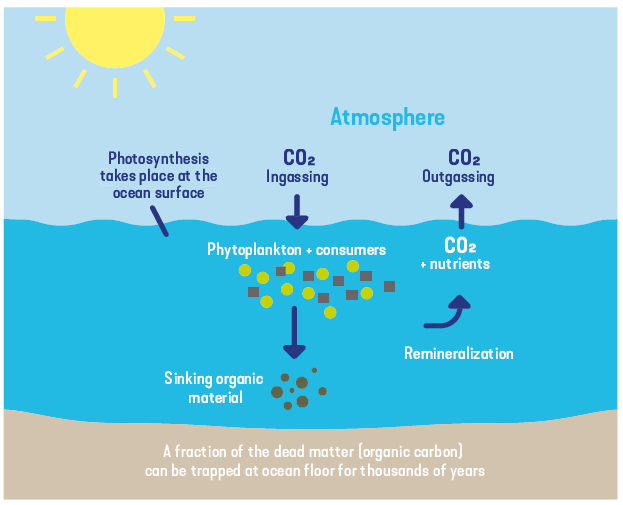 About one fourth of human-induced CO2 in the atmosphere is stored in the ocean through carbon uptake. This is largely measured through the CO2 flux (surface downward flux) over the global ocean. In general, the ocean acts as a sink or a well for CO2. However, the ocean’s uptake of CO2 varies greatly from one region to another. Positive reddish values in the map below correspond to the ocean’s uptake of CO2. “Ocean Colour” refers to the measurement of chlorophyll-a in the ocean and is used as a proxy to measure phytoplankton. Phytoplankton are a microscopic algae that forms the base of the marine food chain. Through photosynthesis, they are responsible for absorbing large amounts of CO2 (see CO2 biological pump in the illustration below). They also produce more than half of the oxygen content in the Earth’s system. It is thus important to closely monitor phytoplankton, as fluctuations have strong impacts on carbon and oxygen cycling as well as on the marine ecosystems and subsequently human food sources. Traditional ocean colour products measure total surface chlorophyll-a, the green pigment produced by plants that is vital for photosynthesis and is visible by satellite. Thanks to recent scientific innovations, this satellite data is now segmented to identify different types of phytoplankton based on their reflective properties in the new product release. This Phytoplankton Functional Type (PFT) data is assimilated into numerical models, making them both more accurate and detailed. The TOSCA Copernicus Marine Service Evolution project developed the first system that assimilates the new ocean colour product for PFTs into a marine ecosystem model for the Atlantic and global oceans. 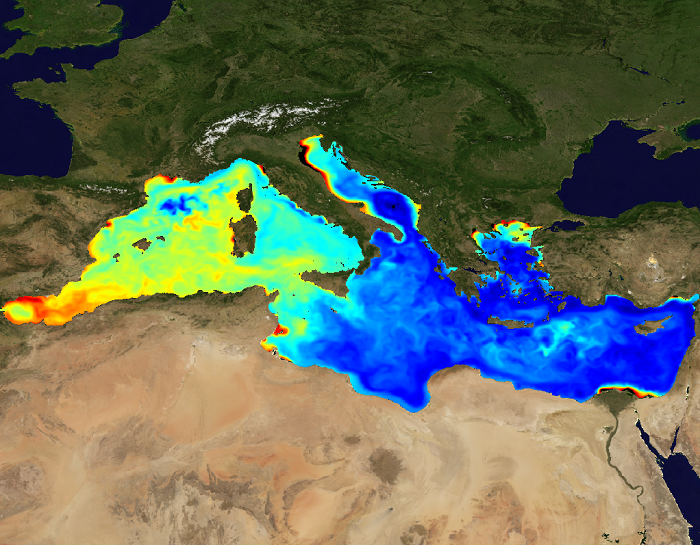 The RITMARE R&D project has worked on this for the Mediterranean Sea. The outcomes of this project were used for the April 2019 release of the PFT product, which provides estimations of PFTs in the Mediterranean Sea from 1997 to 2017. The health of phytoplankton depends also on the nutrients available in their immediate habitats. Thus, these nutrient variables are important tools to predict the impact of climate change on marine resources. The new nutrient product is derived from in situ observations and complements other Copernicus Marine products displaying nutrient concentrations from model outputs. This new product is key for the scientific validation and accuracy checking of such model outputs. This represents a milestone because monitoring nutrients across the ocean remains challenging, mostly because of the lack of data. However, over the last decade, the Argo BGC array has provided new measurement capabilities for biogeochemical parameters that are used to improve biogeochemistry models. The new product update benefits from these Argo-BGC nutrient profiles. 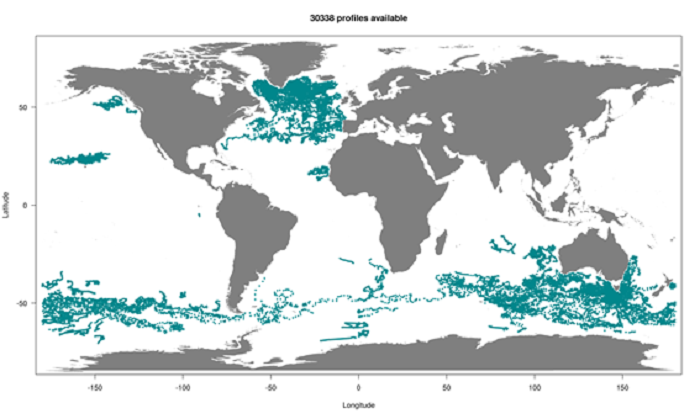 More than 30,000 vertical profiles (data collected at different depths during the dive of a given float) are available from 2004 to 2018 and are mostly located in the north Atlantic Ocean and the Antarctic region (figure 4). The future integration of the Argo BGC data into the Copernicus biogeochemical model will mark a major improvement in the model’s accuracy and predictive capabilities. The Copernicus Climate Change Service (C3S) has compiled the data that forms the basis of the European State of the Climate 2018, an essential snapshot of the region and a useful benchmark for future assessments of the environment. Presented at the European Geosciences Union General Assembly in Vienna last week, the main findings highlight the climatic conditions in 2018 and the changes in key climate variables for different areas of Europe. The Paris Agreement of the United Nations Framework Convention on Climate Change (UNFCCC) was adopted on December 2015 by 194 countries and entered into force on 4 November 2016 (ratified by 185 parties as of today). The main goal is to limit the global average temperature increase to well below 2°C this century. While this is intended as a long-term threshold, the latest five-year figure is the highest on record, showing warming has already reached about 1.1°C. This highlights the importance to monitor the progress of the international community in curbing greenhouse gas emissions, by using reliable records of climate data. The European Union supports efforts to monitor climate change through various initiatives. These include the Copernicus Climate Change Service (C3S), which is implemented by the European Centre for Medium-Range Weather Forecasts (ECMWF) on behalf of the European Union. Through this service, an authoritative annual report on climatic conditions in Europe is made available to inform decision makers and citizens. Following last year’s inaugural report, the European State of the Climate recently delivered its second review of our changing planet, using information from C3S and other contributors as the basis for a set of key indicators that provide an overview of the year 2018. The main findings of the report were presented by Freja Vamborg, C3S Senior Scientist, last week at the European Geosciences Union General Assembly in Vienna (7-12 April 2019). This event is the largest European geosciences meeting, attracting more than 14,000 scientists from all over the world. This report demonstrates the European Union’s commitment to providing up-to-date information on the state of the climate because of its impact in a range of areas, such as agriculture and food security, disaster prevention, energy, health, tourism and water management. The scope of the report, which was compiled by C3S, is reflected by additional contributions from the Copernicus Atmosphere Monitoring Service, the Copernicus Emergency Management Service, the Copernicus Marine Environment Monitoring Service, the Copernicus Land Monitoring Service, ECMWF and other partners. 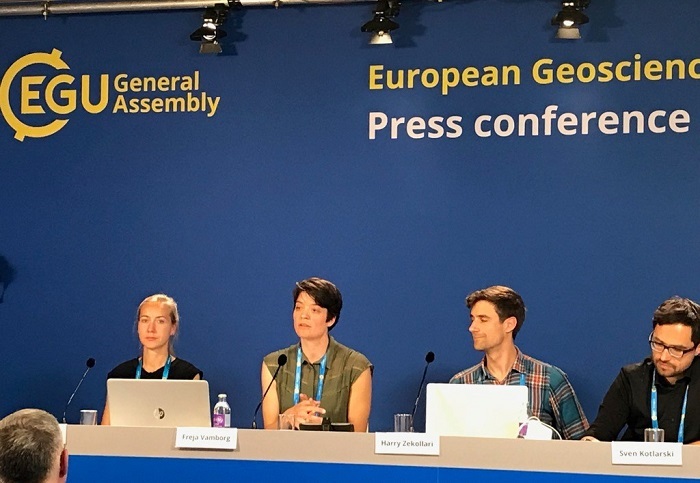 Freja Vamborg, C3S Senior Scientist presents the European State of the Climate at the European Geosciences Union (EGU) Press conference. Credit: Copernicus Climate Change Service (C3S)/ECMWF. The European State of the Climate 2018 describes the annual and seasonal climate anomalies of last year primarily compared with the 1981-2010 climate reference period. The focus is on Europe and the European sector of the Arctic, highlighting specific events such as the unusually dry summer that occurred in northern and central Europe. From spring until the end of summer, almost the whole of Europe has experienced temperatures above the seasonal average. Additionally, the report summarises global information for the key climate indicators such as surface temperature, greenhouse gas concentrations, sea ice cover, glaciers mass and sea level. The report found that 2018 was one of the three warmest years on record for Europe. All seasons were above average in temperature, with summer being the warmest on record.. Notably, central Europe experienced exceptionally warm temperatures, the highest recorded in the region since at least 1950. There was also an extended period of drought that mostly affected central and northern Europe, where seasonal precipitation was less than 80 percent of normal levels for spring, summer and autumn. The drought resulted in agricultural losses and water restrictions, with low water levels in rivers also causing restrictions to shipping. By contrast, some areas in southern Europe experienced the wettest spring and summer on record. “The warming of Europe is quite clear when the annual European average temperatures are examined, with the top 10 warmest years all recorded since the year 2000,” adds Gerard van der Schrier, a KNMI scientist who also contributed to the report. Running 60-month averages of European air temperature according to different datasets. Credit: Copernicus Climate Change Service (C3S)/ECMWF. 2018 included ex-hurricane Leslie hitting the Iberian Peninsula in October, causing the strongest storm in the region since 1842, with heavy rainfall and flooding in northern Spain and southwestern France. The year also saw the highest annual wildfire emissions since 2003 in Scandinavia and around the Baltic Sea favored by high temperatures, low rainfall and dry vegetation. In line with the warm temperatures across the region, the duration of sunshine was also exceptionally high. Regions in central and northern Europe experienced up to 40 percent more sunshine hours than average, with Germany having the sunniest year on record. By contrast, southern Europe’s wetter-than-average year was associated with below-average sunshine duration. The summer surface water temperatures of European lakes were also the highest since the beginning of records in 1995, at 0.8°C above average, which is slightly higher than the temperature anomalies recorded across all the 923 reference lakes worldwide. “Satellite observations collected within the Copernicus program are vital for the monitoring of lake surface water temperatures, which provide an important indicator of the hydrological cycle as well as the impact that climate change is having on lake ecology,” says Chris Merchant, a professor of ocean and Earth Observation at the University of Reading in the United Kingdom. “All the lakes observed in Europe have shown a consistent increase in temperatures,” adds Laura Carrea, a postdoctoral research assistant in the university’s Meteorological Department. In the European sector of the Arctic, sea ice cover continued to decline in 2018 according to a downward trend that became prominent after the year 2000. Sea ice was 30 percent below the long-term average during the summer months. An area of open water occurred north of Greenland in winter and this has been observed for the first time in the cold season since satellites began monitoring sea ice in 1979. Although Arctic sea ice cover shows large seasonal variability, the area north of Greenland tends to have stable conditions of thicker and older sea ice coverage, especially during the winter months. Glacier mass decreased across Europe, particularly in the Alps. In this region, reference glaciers showed extreme declines due to the exceptionally warm summer temperatures, which more than offset the consequence of the heavy snowfalls of the winter months. Since 1997, the monitored glaciers in Europe have lost a substantial amount of mass with a regional average of around 16 tonnes of freshwater per square metre. 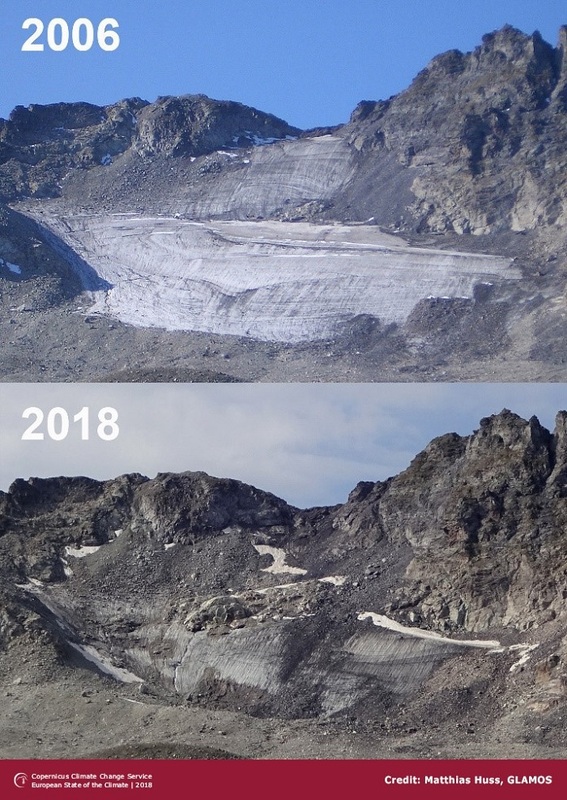 Pizolgletscher in eastern Switzerland in 2006 and 2018. Many of the small glaciers in the Alps are disintegrating due to the extreme mass losses of the last years. Credit: photos by Matthias Huss, GLAMOS. The European State of the Climate 2018 report is based on measurements from satellites and in situ stations, and on data from global ‘reanalyses’ – a consistent combination of computer modelling as well as multiple historic data sources. Included are datasets from the C3S Climate Data Store, a single point of access to past, present and future climate data and information. Available to all users on a free and open basis, it combines the functions of a distributed data centre with a set of services and facilities for users and content developers. C3S monitors climate on a global scale, including surface air temperature, precipitation and sea ice cover. This data is vital to addressing the challenges of climate change. The European State of the Climate 2018 produces meaningful insights from this trove of data to demonstrate how our climate is changing. EASME and DG GROW have launched a series of roadshows whose aim is to foster the development of applications with space data and other geo-information systems; to develop the technical and scientific skills needed to work in the space data sector; and to encourage citizens’ interest in earth observation activities. 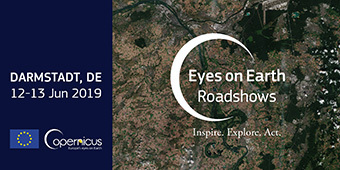 The Copernicus ‘Eyes on Earth’ Roadshows will bring the EU Copernicus programme and the Earth observation sector closer to citizens thanks to a series of five, highly interactive, events in five different EU Member States from June 2019 to March 2020. The ‘Eyes on Earth’ Roadshow in Darmstadt will demonstrate how the European Union’s Copernicus satellite programme helps us all better understand our planet; and creates jobs and business opportunities. The event, which will include an expo area with interactive tools, business presentations, interactive masterclasses dedicated to real business cases (e.g. how to deal with heat islands in cities), and network/matchmaking sessions, will provide a multitude of benefits to participants of all ages and all walks of life. Learn more about how to protect our natural resources and the environment through Earth observation and satellite activities. Find how the EU Copernicus satellite programme is working to help us preserve our planet. Experience hands-on how space data can improve your business and operational goals and achieve your policy objectives. Meet with experts; learn about the skills for earth observation activities; and discover career and entrepreneurship opportunities in the space sector. Share your geospatial expertise and the benefits of the Copernicus programme with keen audiences across Europe. Show how we can manage our consumption and our use of the Earth’s natural resources to protect the environment for the benefit of future generations. Show how Copernicus will help to guarantee the safety, security and quality of life of the millions of future Europeans, and respond effectively to disasters and crises. Demonstrate how can we not only improve our understanding of the causes and consequences of climate change, but also how Copernicus provides solutions for the protection of our environment. Use of Copernicus and Earth observation insights to address gaps in the skills agenda. Help shape the space data professionals of tomorrow. Grow your business through the optimal use of geospatial data. To get the most out of the roadshows, we encourage participants to have an open mind and actively participate in breakout sessions on the application and opportunities of space data. Participation in all Roadshows is free of charge The registration to the first Roadshow in Darmstadt, Germany, will be available soon on the Copernicus Events Calendar. The Copernicus ‘Eyes on Earth’ Roadshows and the digital skills support action is implemented by a Consortium composed of stichting dotSpace (the Netherlands), LOW (Belgium), RAMANI B.V. (a spinoff from ITC, the University of Twente's Faculty of Geo-information Science and Earth Observation, The Netherlands) and the Erasmus Centre for Entrepreneurship B.V. (ECE, the Netherlands). Could not retrieve http://www.copernicus.eu/event.xml - Page not found.